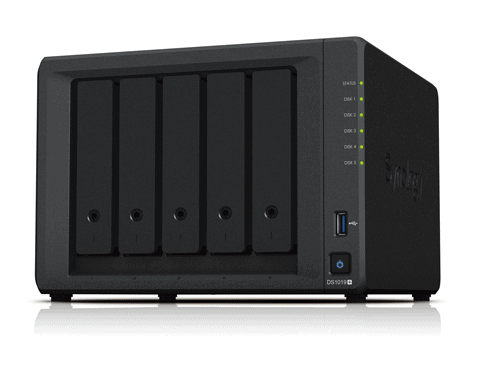 Synology Inc. has launched DiskStation DS1019+, a 5-bay desktop NAS with excellent performance and scalability, right for small offices and IT enthusiasts. DS1019+’s scale-up design allows a seamless storage expansion with minimal effort, making it an ideal server for file sharing, data backup, and recovery. Pre-loaded with dual-channel 8GB memory and NVMe SSD cache support, DS1019+ provides sufficient horsepower for I/O intensive applications and virtualization deployment. DS1019+ runs on DiskStation Manager, the advanced and intuitive operating system for Synology NAS devices, with various applications offered to enhance work productivity. Synology has received numerous media accolades, topping the mid-range NAS category in TechTarget’s storage solution survey and winning PCMag Readers’ Choice eight years in a row. SYNOLOGY Launches DiskStation DS1019+, for Small Offices and IT Enthusiasts 0 out of 5 based on 0 ratings. 0 user reviews.